Our Edwardian Farm year is over! We have packed up the cottage, sent the animals off to their new homes and said a reluctant goodbye to all the many local people who so generously helped us. But although it's over for the farming team and the crew - you can join us at the very beginning when the new series airs tonight on BBC Two. It has been such a full year, hardly time to breathe let alone think. Alex Langlands, Peter Ginn and I are now quite a long standing team. Having lived through a 1620s year for Tales Of The Green Valley and then an 1880s year for Victorian Farm together we know each other well and have all ended up with our own interests and responsibilities. This year we moved the filming to Devon, at Morwellham Quay, and while the action is based primarily on the farm, the new location allowed us to explore other aspects of the working countryside, including rivers, coasts and mining. Peter's soft spot this year was for his fish. When it was suggested that we should have a go at hatching and raising trout for the sport fishing trade, Alex and I were rather sceptical, but Peter got stuck in immediately. The odd contraption in the woods was regularly fiddled with and lovingly supplied with fresh juicy maggots throughout the summer. I don't know who was most surprised at its success, Peter or us. Alex arrived for the year with his own cockerel - Sunny - under one arm, determined to make a go of poultry farming. My, was that cockerel pampered. As we accurately portray the life of the era and the roles played by men and women, I always get the domestic work, which whilst it does mean loads of cleaning and washing also means that I get to do loads of cooking and making things, both of which I really enjoy. Ooh the food of this region has been a joy - scrummy and interesting. I also got a bike - wheeeeeee!!! The freedom, the speed, you have no idea of the sense of liberation. Around the farm Peter supplied the most astonishing amount of muscle. Think you need a machine to do that job? Ha! Call Peter! It is not possible to overstate just how physical Edwardian country life was. We have certainly all worked our socks off, farming, mining, scrubbing, fishing, a thousand and one jobs. Definitely worth it though, we have had a great year, so interesting, loads of fun and wonderful, wonderful people. Ruth Goodman is a participant in Edwardian Farm. 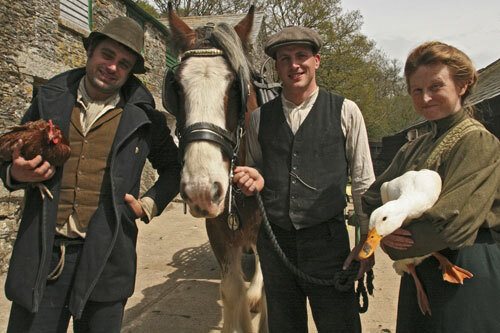 Edwardian Farm is on BBC Two at 8pm on Wednesday, 10 November. For further programme times, please visit the upcoming episodes page. Can you please remind me what breed of sheep you went for in the Edwardian Farm? Fantastic....I live on the Cornish side of the Tamar......just opposite where thsi is being filmed. Only one complaint.......WHY does the narrator keep calling it Morewellam??? It was pronounced correctly at the start of the programme....It's More-Well-Ham!!!!! Another fantastic series. Thanks aunty. We have hugely enjoyed watching the Victorian farm programmes. They've also been a great way to learn about history for my children. I home educate one of them and am grateful for this help with history so I have spread the 'Victorian Farm' word to the home education groups that we belong to. The subjects have been fascinating and the presenters are so likeable. Thanks to everyone responsible for such interesting, entertaining and educational programmes. Forgive me if this has been covered elsewhere, but do the three people really spend a full year at the farm? I mean, are they actually living at the farm for at least, say, 300 of the 365 days and nights? doodle dandy: the sheep are Whitefaced Dartmoors. I have just enjoyed the first episode of the series and was not disappointed. As I (sadly) can't find anyone to build me a time machine, this series is the next best thing! Having been glued to my TV set during Tales of the Green Valley and the Victorian Farm, I can see myself being transfixed by rural Edwardian loveliness! Yesterday a phrase used was to 'absail' down the pit, is this an edwardian expression ? could you let me know who the clothing supplier for the programme was? I thoroughly enjoyed tonight's programme (notwithstanding the sheep's head!) but was surprised to see a latchet hook being used for rug making. I understood that they were invented in the 1920s, taking the design from knitting machines. Is this wrong? A wooden bodger, custom made or crafted from an old clothes peg, would have been more likely in Edwardian times, or a Brown's patent rug making tool for the better off. I have many types of rug making tool so if you ever do a programme with rugs again I would be happy to help. I work at Bantock House Museum in Wolverhampton where I started the very popular rug making group. Did they close Morwellham to the public just during filming? I haven't been there for quite a few years, but it is a great day out. Hi There, I have only just returned from holiday and have missed episode 1, does anyone know if it will be repeated in the near future? I know that I can watch it on iplayer but I like to record the series to DVD. I would be grateful if any kind person out there has a copy to send me. I love these series. Thanks. Disappointed at the complete misunderstanding /misinformation on the nature and use of Quicklime and confusing it with Ground Limestone. Quicklime is highly caustic and corrosive and was (and still is) used for building ( mortar )whitewash,painting walls,sanitizing and disinfecting. It would be insane to spread it on grass which would 'burn' the earth where nothing would grow for years. .. so much for research and general knowledge at the Beeb. I am also interested in the costumes. Are there any patterns available? I too wondered about the use of quick lime. Surely it is a dangerous thing to be transporting around the country in an open wagon. Would you not have slaked it first? It is no wonder the horse was a bit skittish when they were trying to spread it. The rest of the programme was a joy, especially seeing how the whole community knits together with all the extras, like the boat bringing in supplies. It was a joy to watch. Some things make the licence fee worthwhile. Would someone tell me the names of the 2 heavy horses on the farm please. I painted a portrait of the 2 horses that were at Morwellham Quay in 2002, Rob & Mac, one looks like the lighter coloured horse with the grey mane but I don't recognise the darker of the 2 horses. Another brilliant episode of this fantastic series based on brilliant ideas. Even if the very toothsome Peter Gill was not in it, I would still watch it. With all the recessions and cut backs we will soon be moving backwards in the way we do things insted of forwards. Is Peter Welsh BTW, my friend says yet. I enjoy the enthusiastic teams portrayal of life both Edwardian and the earlier Victorian series but PLEASE guys, get some professional, skilled and knowledgeable training in on-screen demonstrations of farming skills such as hand milking that poor goat last night - it would get mastitis (udder inflammation that can be fatal!) within weeks if regularly 'milked' (I use the term loosely!) the way the team tackled and would be no laughing matter for the goat or the edwardian family when they caused the mastitis by poor milking practise! Viewers can be inspired to rush out and acquire animals thinking it's easy and requires no skill and this causes suffering and upset. To uusikaupunki1870 #14, the Wednesday night episodes are repeated at 7pm on Friday's, but I'm afraid episode 1 has been and gone, the series is however out on DVD in February. And to Earl #15, we are aware of the difference between quicklime and ground limestone and considered the latter, but were advised repeatedly that in this location quicklime was used in the form we demonstrated because local farmers considered it desirable to let it "burn" on the ground. Extensive research supported this and we opted for the method which was most authentic to not only the period but the regional practice. I'm pleased to say it worked, and we grew a very successful oat and potato crop there – but you'll have to wait until eps 11 and 12 to see for yourself when we harvest the crops. What are the contemporary farming guides that they are consulting please? I want to get one for when pandemic flu sends us all back to Edwardian times! in answer to diffusa - the excellent Book Of The Farm by Henry Stephens remained very much our "bible" for the series. In Victorian Farm we used a Victorian edition; this time we got hold of the updated Edwardian edition of his work. Equally indispensible is The Agrarian History of England and Wales 1850-1914 Vols 1 and 2. We also used the Board of Agriculture and Fisheries Leaflets from the period - we got bound collected volumes of #1-100, #101-200 and #201-300 - which proved a rich source of helpful information and practical guidance. in answer to asteriods, the reason our narrator pronounces the location as "Morwellam" rather than "More-Well-Ham" is this: People who live in the vicinity of Morwellham call it "More-well-HAM" to distinguish it from other Morwell-prefixed places such as Morwell Barton and Morwell Rocks. But we were advised by locals to call it More-WELL-am as that’s how it's pronounced in the wider Devon - and beyond. Please can you tell me the quantities used in the chicken winter feed mixture ? Congratulations to Ruth, Alex and Peter for again presenting such a fascinating insight into life as it was in the Edwardian times. Their enthusiasm and dedication to learning how things were in those times and then giving us all this information in a most entertaining manner makes for compelling viewing. Please can we have more programmes presented by them and I for one would love to see a new series on The Victorian Farm, possibly covering other areas of life as it was then that didn't appear in the first series. A question - in episode 2 of Edwardian Farm Ruth pickles apples in a post 1946 Kilner jar (no moan about the age of the jar as the pre war ones were devils to seal). Please please tell me where you got the red rubber seals for the jar as I have being trying to get replacements for ages without luck- all mine have turned to goo. Brilliant series - I LOVE it! where do you get your caps from ?. Very much enjoy the programmes. Seeing the early tractor reminded me of a conversation recently with a french farmer whose father worked with plough oxen. He told me how his grandfather told of the times when one man working in a field would strike up a song which would be picked up by a neighbour in an adjoining field and the singing would spread down through the valley with all joining in...then the tractors came and it all changed, too noisy for singing. Would have loved to hear it. For peter2006 #28: the rubber seals for the Kilner jars were from Ruth's own collection, so thankfully we were spared the ordeal of sourcing them. For luvachicken #25 and tamsinbrn #27, the exact ingredients of the chicken feed were as follows: Wheat (cracked) 3 parts, Dari 2 parts, Canary seed 2 parts, Oatmeal 2 parts, Millet 2 parts, Broken maize 1 part, Hempseed and buckwheat each ½ part, Rice 1 part, Meat (granulated) 1 part, Grit 1 part. To Pottypainter - in answer to your question of 16 November - the two black shire horses currently in residence at Morwellham are called Tom and Prince (Prince is the one with the white face). The bay heavy horse used to spread the quicklime was Jack, who is a Clydesdale. Happy painting! Thankyou for all your comments and queries. I am not a naturall blogger, but will do my best. I really think it is great that people mind about the details. Nothing in life is perfect, but we really do try - that after all is the whole point. First the query about clothes. As everything started up in a great hurry clothes were made by a variety of different people. Jinny and Jane both usually make for the re enactment market, whilst Valerie used to work for Morewellham and Betty used to volunteer her knitting services. My own clothes however were from a slightly different source. I have a strong interest in clothing history and wanted to be closely involved in what I was wearing. I researched, designed and cut all my own clothes, although with time so short I got a friend - Julie - to do most of the actual sewing. The real challenge was to make clothes worn in that part of the country - not London fashions - by people of that social standing and income level. My red felt hat came from photographs of people in and around Tavistock and seems to have been a style of very limited reach - it doesnt appear in photographs from outside about a twenty mile radius. Rag rugs - mea culpa. I meant to use a button hook, rather than the more modern rug hook. Sorry about that. Enjoyed making the rug though. gardenfarming sue - None of the goats got mastitus, they all went home after their stay on the farm happy and healthy. I am sorry that you were worried about them. I have had mastitus myself years ago when I was feeding and it is no laughing matter. Our life on an old Welsh farm is closer in many ways to the Edwardian farm than 2010. Secondly, much more information on Ruth's restoration of the privy would be welcome. Did they put lime into the bucket after each use, or earth or sawdust? No separation of liquid and solid matter? We have been looking at modern composting ideas to put our privy back into use and have wondered, after all we have read, whether the reason we have a double seater is not for companionableness or one smaller hole for children, but because the solid matter was composted and the liquid left to drain away. Our privy is a long way away from our pigsties. In fact, it's situated in the old vegetable garden. @Honoramorton - as a keen gardener I think I can answer this one - liquid waste would probably have been mixed with water and used as a liquid fertiliser, solid waste also known as "night soil" would have been buried in a technique known as "double digging" the veg plot. The filming in this series has been a delight - the most evocative for me was the filming of the cider press - the golden back light of the sunshine into the apple juice made me long to be there. The cooper and the blacksmith were also very good. The shots of shire horses entering the field on a frosty morning, the hedge layers at work - all magical stuff. Great job all round - it has set me off on a few enterprises and concerns. I may not be looking hard but I can never find any sloes to pick. Will have to read up on them more to find where to pick them. Really enjoyed the series and have even started making my own proggy mat!! Well done, another fantastic series. I am a teacher and have discussed you work with my students. They are fascinated by some of the details and they see what you are showing them as a real window into a lost world. We have may animated discussions in class and I teach maths! Can you please advise where the Tannery was located? The tannery is in Colyton . . . fascinating place! @northeastfirstaid: Sloes are the fruit of the Blackthorn and are most often found in a mixed hedgerow along with Hawthorn - the fruit is usually on the underside of the stem and in early October often behind the leaves - the leaves on the Blackthorn seem to stay on the bush a little longer the Hawthorne which means it can be seen from a distance in early autumn. You do need to 'get your eye in' as the yeast on the sloe berry can make them merge with the background. A very enjoyable series, as were the previous two. All very informative. Particularly like the livestock. Still an ambition to keep some Tamworths and get a Shire. Bit difficult with a small bungalow garden but one can dream. Hi, I'm really enjoying the new series. I was just wondering if any one could tell me the name of the country house that Ruth went to work in as a domestic servant in episode 4 and the book they talk about 'The Gentleman's House' I think its called and who its by? many thanks. I'm doing my Masters in Historic House Studies and am writting an essay on the staff of the 'Big Houses' and would really love to know where the team do their research for the series and if they could recommend anything. The house is Lanhydrock near Bodmin and the "Gentleman's House" is available on googlebooks. Thanks for bringing many happy memories back - I used own an old miner's cottage in nearby Gunnislake. Are there any plans to do any further series? Maybe further back in time? An excellent program. Ruth Alex and Peter are brilliant . I enjoyed the Victorian Farm too. Great series. Have been searching for Mrs Widgeon and her Baked Dinner but have not found anything online. Are her recipes published or can you provide details of the baked dinner please? Hiya! I am very interested in the Edwardian recipes you are using and have tried to find similar recipes online but I can't find any. I'd really like the precise recipes so I can try them myself at home. Could you post them on here or even better create a recipes section or something? My apologies if you have already done this, I've had a quick look on the site to see if I could find them but no luck, if they're on here somewhere just point me in the right direction! Thank you so much and keep it up this series is fascinating! Enjoying Edwardian Farm, as we did Victorian Farm. Who supplied the marvellous (native) Devon cattle? Did they return to their home herd after the year's filming? Not that it hugely matters, as the series is great so far and looks like it will be as good as the previous two, but some friends and I have been discussing how much time was actually spent by the team actually living on the farm. Really, how was the series made - we'd love a 'behind the scenes' or 'the making of...'. It must have been a huge undertaking by the team regardless! Andrews Alan & Safiravv - I have put several of the recipes I used in the book to accompany the series. Mrs Widger's roast dinner came from a wonderful book that I used repeatedly throughout the year called . A Poor Man's House' by Stephen Reynolds. It was written during the Edwardaian period by a gentleman about his experiences as the lodger of a very ordinary South Devon family. As for Edwardain recipe books - well surprisingly few were published in this period. This seems to be due to the phenomenal popularity of Mrs Beeton at this time - more copies were printed and sold in this period than in the Victorian. In searching for the local Edwardian life I used a lot of recipes recorded in autobiographical material, letters and so forth rather than London based publications. Privies- In general most people put both solid and liquid waste in the same cess area. An earth flour to the pit helps it to drain away and part of the menagement of the pit involves an occaisional bucket of something dry and loose textured to prevent it all becoming wet and slimy. Just like a compost heap you need a mix of slow to rot dry matter to allow air into the heap along with the wetter and quicker to decay matter. For cess pits this means regular additions of straw or dried leaves, scrunched up paper or sawdust along with the human waste. One of the benefits of the combined human/pig method is that their straw bedding provides a good part of this mix allowing a quick and relatively smell free composting process. Well done to all involved with Edwardian Farm. Entertaining and educational, as was the Victorian Farm. When the current series has ended I should like to see the show that the team were involved with before,- which was 'Tales from the Green Valley' a series that I missed when shown first time around. The programme tonight said that British wheat lost out to world markets due to price. It's not strictly true. Climate has always given a lower protein wheat here in the UK and in Edwardian times we were using predominately wheat or flour from the plains in Canada. Their gluten levels were much higher than here and more suited to the kinds of bread being produced at that time. It was only really in the latter 20th century when the introduction of the Chorleywood bread making process allowed lower protein level wheats from these shores to be used on their own. great series as was the victoria farm but would love to know if Ruth tried spinning the wool from the sheep. as a spinner (and teacher) myself I would have thought that most farmers' wives would have spun their own fleeces. Some weeks ago Ruth mentioned an Edwardian cure for nits. Can you please remind me what it was, so we can try it on our daughter and get rid of them once and for all. I think David Upshalls response (24) to asteroid's comment (2) about the pronunciation of Morwellham is a bit of a fudge. Of course you have to try to please everyone, but people tend to adopt the BBC gospel and renaming places rides roughshod over centuries of tradition. Five miles away in Tavistock, where I grew up, they call it Mor-well-ham. I even know one or two of the local characters who pop up on your programme and they call it Mor-well-ham. The same was true of my great aunt and she lived of the village of Mor-well-ham. That's what it's called. Time to fess up, David, you got it wrong! Otherwise, wonderful programme. Intelligent and good fun - but keep the fudge in the sweet shop please! I enjoy the series but as in the Victorian Farm they drink cider from pewter tankerds. I have always belived that the cider reacted with the lead in the pewter and that cider was / is drunk from horn, china or glass vessels. to Gazehounds post on pewter - the acidic nature of cider does leach out the lead content in pewter more readily than ale, but the use of lead in pewter was not removed until the 1970s. pewter being more hardwearing than ceramics it seems likely its use would have been standard. for a longwhile some cider makers stored their cider in lead lined casks. in my experience pewter does nothing to tarnish the flavour. your series is one of the best i have ever seen on the bbc. thank you. from a fellow history nut / archaeologist. First, many thanks for a really entertaining, instructive and eye-opening series. I am now 61 and remember my grandmother regularly cooking sheep’s brains in her pressure cooker for dinner and so the recipes shown brought back many memories. However, the item that really jogged my memory was the piece on mining and especially the work involved in drilling and blasting. I come from a long line of Yorkshire miners and the piece brought back the story of my great great grandfather who had emigrated in the mid nineteenth century to the Pennsylvania coalfields. He was a shot firer and, as you made clear for the Cornwall miners, like them he had to buy his necessaries from the mining company - black powder etc. However, in his day, they had no nice fuse wire as was shown last night. Instead, in those days (and, I suspect, in Devon and Cornwall at the time), he made his own fuses from straw infused with black powder. To make a fuse the straw was knotted and it often went out once lit. One day, he thought his fuse had gone out, went to investigate and arrived at the firing hole at the same time as the flame from the fuse - he had tied a large knot and it had taken so long to burn through it that he thought the fuse had failed when it hadn't. He was killed in the subsequent explosion and his family returned to the UK otherwise, I might be an American! Finally, the item also triggered a thought - what came first, the Phoenicians looking for tin or a tin industry already so established that the Phoenicians heard of it from the middlemen who sold it to them in the Mediterranean and who tried to cut those middlemen out by buying direct from the source - a basis for a new series tracing trade through metals perhaps? First of all, many thanks to all the team, and to the very hard-working presenters. Wonderful, entertaining and extremely interesting - it really gives one a taste of the past. Episode 6 had a travelling salesman, with some extraordinary wares (loved the teasmade). However, he had one wrong item. His "bird imitator" was in fact a medical instrument, still in manufacture, well-known even to today's ENT surgeons - it is called a Barany Noise Box. It is used to "occupy" one ear with loud sound while testing the other. I suppose it might imitate a bird...! Programs like these are increasingly rare jewels amongst the mass of inane "reality tv" shows. My father grew up on an Edwardian farm and he is having a wonderful nostalgia ride with this series. I hope the BBC will give the nod to further projects like this - The Victorian Country Village perhaps? For those of you too young to remember, there were three excellent series on the BBC about twenty years ago called "The Victorian Garden" - they are available on DVD and are much recommended to fans of Victorian Farm and Edwardian Farm. Thank you to Ruth & all the team. It really is a pleasure watching the programme every week, demonstrating how things were done in the past & the seasonal events taking place. It was especially lovely to see Ruth's daughter join this week as well. Shame about the egg blowing for the easter celebrations on this evening's programme! I'll miss the programme after the end of the series. Thank you so much Ruth & team for the enjoyment & pleasure you've brought into our homes each week. I know Ruth from her work at the Weald and Downland Museum in West Sussex. She patiently demonstrates how to make period costumes to the historic needlework group there, and as months go on, more and more of us complete our projects using methods and materials appropriate to the time, and then interpret the museum buildings wearing the clothing of the period. Thanks, Aunty, for another great series and many thanks to Ruth and the boys. My home was once a Tamar Valley market garden (in Cornwall and not a stones throw from Morwellham). Its been nice to get some insight into how it would have been when it first started. As I understand it though we had a lot of glasshouses and grew tomatoes up until the 1970's. We still have the old prep room and the outside toilet. I always did wonder why we had so many strawberres coming up in the garden each year when I first moved here. Now I suspect I know , we grew atrawberries where the garden now is. Thank you for the insight into how things ran. I dont know what to say, tonites program is a discrace, you can't proclaim a stickleback to a brown trout its wrong. I also question the legality of having the shoddy built hatchery on a stream, by allowing the fish to leave the hatchery and enter a river is a illegal offence under the salmon and freshwater fisheries act 1975. I shouldent worry though becuase due to the high amount of silt that you allowed to kill the trout will stop them from escaping and as for any that that didnt KILL there is always the fact you did not feed the fry, there will be no natrual food in that box you created because it is not a river bed. not properly feeding fish also is against animal welfare regulations. Would it be possible for short bio's of the team to be posted (without being too personal?) My husband is the image of Peter Ginn, he was adopted and is always looking for his half brother. His ethnicity is not completely English - he has Turkish/Greek roots. I am wondering if Mr. Ginn is of the same ethnicity? Sorry, forgot to ask of David Upshal - whilst growing up in Orpington, Kent a friend whose mother was an English teacher lived a little way down the road. I am wondering if this is the same David Upshal? Is is a small world, that is for sure. Whether it is or not, must say this program is much overdue and very welcome. Does anyone know what the name of Alex's hat is? And where you might get one from? Thoroughly enjoying this series here in the States. I have a smallholding and though we are vegetarian and probably wont be boiling any sheep's heads soon I have thoroughly enjoyed watching you do it. Boys are gorgeous, Ruth is a firecracker. Your floor washing puts me to shame..time to get out the brush! As a period reinactor and historical educator myself, I understand the fun of doing everything from costuming to recipes to farming the old ways. I inherited my great grandfathers draft harness, a real treasure. Thanks for all you have done, looking forward to the next period series! Recipe for the cut-rounds please. Are they the same as Devon splits? Have wached all the series of Victorian Farm and now the Edwardian Farm. Is it possible to have the recipe for the CUT ROUNDS. Another request for the recipe, please. I love Edwardian Farm. Ruth, Peter and Alex are such lovely people. They come over as truly interested in the work they are doing for the programme and as a result, we are interested too. So many reality programmes seem to just want to make fools of the participants. Let's have more of the "Farm" programmes and maybe some similar series depicting our social history. Well done BBC. Yes, I'd like the recipe for the "Cut Rounds" too. I too love this series. I love being able to find out about things which really interest me which means crafts, being self suffiicient etc. I would love the cut rounds recipe too please. in the last to been shown episode Ruth with the Chef Richard Hunt was making 'cut rounds'. I have been through all my recipe books (and i have a few and some very old ones) but can't find this recipe anywhere. We often have scones and these sound like a lovely change. So, Ruth or any of the team on the programme can the recipe by posted somewhere please? Love watching Edwardian Farm, especially Episode 9. Would very much like to get hold of the recipe for the "cut rounds" featured in that episode. Can't find anything similar on the web. Can anybody help, please? Try this for recipe for "Cut Rounds"
5. Form into a long round sausage and then cut from length the thickness rounds you require and place on floured baking sheet. 6. Bake for about 30 minutes then cool on a wire rack. As mentioned on the programme it is the interaction between the Bicarb and the Buttermilk that will cause the mixture to rise. Add dried fruit if using for cream tea's. Thank you so much for the recipe for cut rounds! I am another who will be trying it out! Watch this space for the results!!!! Thank you to "dontblameme" for the Cut Rounds recipe. It sounds like the one we saw on Edwardian Farm. I will try it as soon as I get the buttermilk. My husband and I led a self-sufficient life for many years, with sheep, chickens and most of our own grown veg and fruit. We do some of the growing now, but age has meant that we decided to give up the animals. Modern rural life gives us that choice. It must have been a very hard life for the elderly smallholders in the past. The recipe looks good, but didn't the one on the programme have milk powder in it, and that was what makes it bready? Really want to try this recipe! I have watched both the Victorian Farm and the Edwardian Farm series and absolutely adore them. Both my self and my husband think what a great shame it is to loose these ways of life. lets get back to the simple ways of life, yes very hard work but so rewarding. Can we suggest though, that you have the recipes on the programmes site, can we have the full recipe for cut rounds please? Programme producers - please post the cut rounds recipe used in the programme. Thanks, from a desperate scone-eater. I have really enjoyed watching the current series and was wondering if you can tell me where the teasets used by the tourists for 'Empire Day' were sourced or even the makers or model numbers would be helpful. I collect older teasets, such as the ones used, and use them at every given opportnuity. Any help with this would be hugely appreciated. sorry forgot to mention i am particularly interested in the teasets which had matching teapots. Thanks and here's hoping that you can help me. thanks for another brilliant series aunty beeb. It is fascinating to see just how different life was then. I went to Morewellam many years ago and found the whole place amazing. Did they really live there for a year? And did the normal tourists visiting the village get to see them and what they were doing? Thanks for posting the link to the site for the cut rounds recipe (for anyone else wanting to use this - you need to scroll down quite a way!) and to Richard Hunt for providing it. Looking forward to the next episode! What brilliant programmes! I have watched the Victorian Farm and am now currently watching Edwardian Farm . I was lucky to recieve the Victorian Farm book for christmas from my daughter, the book is a brilliant read too! All three of you have brought so much information to us. Thank you!